James Fowler Rusling was born on April 14, 1834 in the town of Washington in Warren County, New Jersey, the fifth of seven children born to Gershom and Eliza Hankinson Rusling. He prepared at the Pennington School, and then entered Dickinson College with the class of 1854 where he studied the natural sciences. He graduated with his class and immediately took up a teaching post at the Dickinson Williamsport Seminary, where he taught until 1857. He was admitted that year to the Pennsylvania bar and began to practice law in Williamsport. In 1859 he was admitted to the New Jersey bar, and he set up his practice in Trenton. On August 24, 1861, he became a first lieutenant and the regimental quartermaster of the 5th New Jersey Volunteer Infantry. By October 1862, he was a captain and quartermaster of the 2nd Division of Third Corps, and in May 1863, he was named as a lieutenant colonel of Volunteers and Third Corps Quartermaster. At the end of the war he was the Inspector of the Quartermaster Department of the United States Army, and he received a brevet promotion in February 1866 as Brigadier General of Volunteers before returning to private practice in September 1867. His extensive service in all of the campaigns of the Army of the Potomac between 1861 and 1863, together with his activities in the Army of the Cumberland for the remainder of the war, are detailed in his 1899 book Men and Things I Saw in Civil War Days. 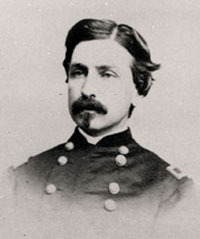 Rusling was an observant and entertaining writer and completed other accounts, most notably the story of his 1866-1867 inspection tour for the Quartermaster's Office of the Army of the West, which he titled The Great West and Pacific Coast (1877). He also wrote a history of the Pennington School. A devout Methodist, he wrote several articles for various religious publications. Back in his Trenton law office, Rusling worked as a New Jersey pension agent between 1869 and 1877. He was also a tax commissioner of his home state in 1896. He served as a trustee of Dickinson College from 1861 to 1883, and then again from 1904 until his death. He married Mary Freeman Winner of Trenton, New Jersey in January 1855, but she died later that same year. Rusling later married Emily Wood of Trenton in June 1870. He and his second wife had a son, James Wood, and a daughter, Emily Wells. James Fowler Rusling died at his home in Trenton on April 1, 1918, two weeks before his eighty-fourth birthday. He was buried in the Riverview Cemetery in that city.